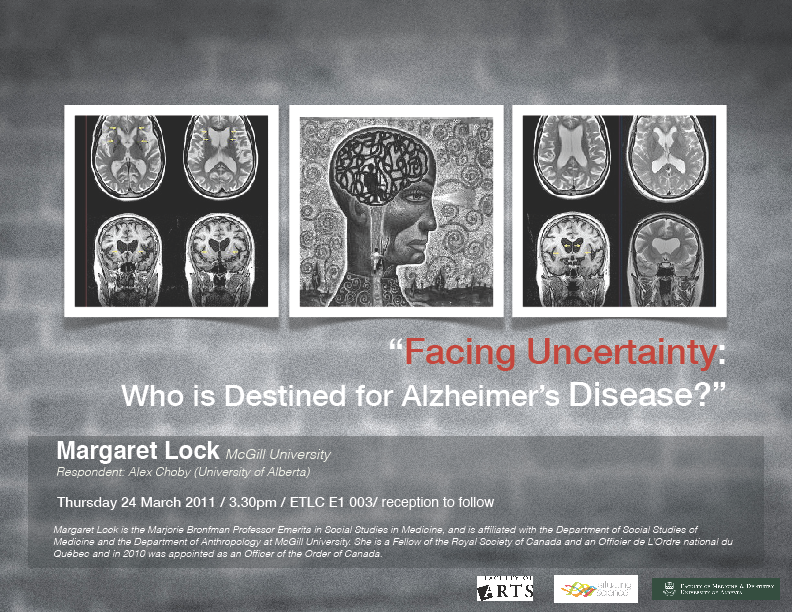 Facing Uncertainty: Who is Destined for Alzheimer’s Disease? Alzheimer’s disease is increasingly described today as an epidemic, both in professional literature and the media, with estimates of 115 million cases worldwide by 2050. Less visible are the ongoing arguments in the medical world about the entanglement of AD with “normal” aging, and the repeated efforts to delineate what exactly constitutes AD. Following a presentation of the competing medical theories about AD causation and its early diagnosis, I will consider public commentary on AD made by the media, AD societies, and members of the public who have undergone genetic testing to assess risk for late onset AD. It is clear that abiding uncertainty about the relationship among aging, dementia, and Alzheimer’s disease are present in both scientific and public discourse, but equally a sense of urgency exists that medicine must find, post haste, a “cure” for this “living death” with its debilitating drain on the economy and on family life. Margaret Lock is internationally regarded as one of the most distinguished and productive medical anthropologists of her generation. She is a professor in the Department of Social Studies of Medicine and the Department of Anthropology at McGill University. She has spent the past 30 years of her career building bridges between medicine and the social sciences, and making seminal contributions to the theoretical foundations of medical anthropology and, more broadly, the social sciences. She is the author of East Asian Medicine in Urban Japan: Varieties of Medical Experience (1980), Encounters with Aging: Mythologies of Menopause in Japan and North America (1993), and Twice Dead: Organ Transplants and the Reinvention of Death (2002). All three books are widely used for teaching, and have helped shape health care delivery and policy in Canada and Japan. Encounters with Aging received six prizes, including the Staley Prize of the School of American Research, the Canada-Japan Book Prize, and the Wellcome Medal of the Royal Anthropological Institute of Great Britain. Twice Dead, her best-selling book to date, won the Sociology of Health and Illness Book of the Year from the British Sociological Association and the Robert B Textor and Family Prize for Excellence in Anticipatory Anthropology from the American Anthropology Association. Lock is a fellow of the Royal Society of Canada, an officier de L’Ordre national du Québec, and, in 1997, was awarded the Prix du Québec, domaine sciences humaines. She received the Canada Council for the Arts Molson Prize in 2002, and, in 2005, was honoured with both the Canada Council for the Arts Killam Prize and a Trudeau Foundation Fellowship. Much of Lock’s research focuses on the relationship among culture, technological innovation, and the body in health and illness. She has been a key participant in a wide variety of contemporary health policy debates in North America, Europe and Japan, and her publications have changed the way medicine is taught and practiced in Canada and around the world. Her broad range of work includes studies into cultural aspects of female aging, the invention of the concept of brain death, and the social repercussions of biomedical technologies, such as genetic testing. Currently, she is investigating how emerging knowledge in molecular biology is transforming professional and popular understanding of Alzheimer’s disease. This entry was posted in Aging, Aging and disability, Cognition, Community-University, Disability, Discrimination, Ethics, Families, General, Health, History, Human nature, Life and Death, Memory, Mental health, Theory of mind. Bookmark the permalink. I’m so glad that the brilliant Margaret Lock is looking at AD!